A Babel Library (French or Spanish on the right, English on the left) Young Adult science fiction novella for ages 9 and up. 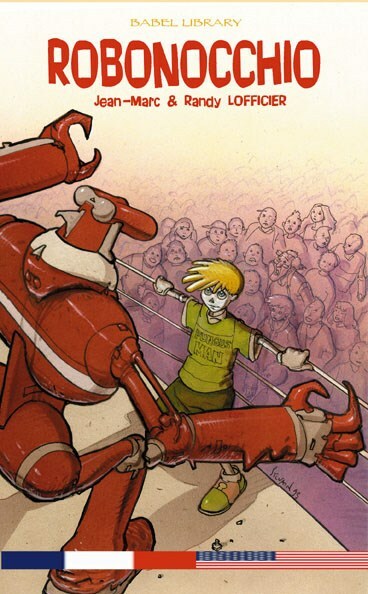 ROBONOCCHIO is the classic Collodi tale recast in modern terms: a robot boy, built for an amusement park owned by the evil conglomerate AMALGAMATED BEHEMOTH, is brought to life by a whimsical blue alien. He and his designer must escape from the villains' evil clutches. J.-M. & Randy Lofficier are the award-winning writers of numerous comic books including Superman and Doctor Strange. They co-authored the children's novelization of The Great Mouse Detective and penned episodes of Duck Tales and Real Ghostbusters. Stephan Martiniere is the award-winning director of the Madeline animated series and the artist behind the Where's Waldo strip.